The alkali lignin, a natural polymer prepared from alkaline papermaking black liquor through concentration, filtration and spray drying, has good physical and chemical properties such as cohesiveness, dilution, dispersibility, adsorptivity, permeability, surface activity, chemical activity, bioactivity and so on. Used as a scale remover and a circulating water quality stabilizer on boilers. Used as a flotation agent for ore dressing and an adhesive for mineral powder smelting. 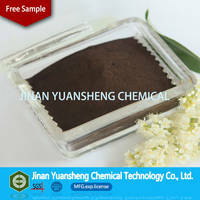 Shandong Jufu Chemical Technology Co., Ltd is professional supplier of chemical additives in China. We are dedicated to the research, production and marketing for various chemical auxiliaries. The corporation has three own factories, 10 production lines. To supply stable and excellent products to customers. From raw materials incoming, products manufacturing till finished products inspection and output, strict control measures is taken in every segments. Besides from focusing on quality, we also pay attention to technology innovation. In recent years Jufu Chemical constantly develops more and more new additives through the positive cooperation with famous laboratories and other enterprises. Our main products are Lignin Alkali, Sodium Lignosulfonate, Calcium Lignosulfonate, Sodium Naphthalene Sulfonate Formaldehyde, Sodium Gluconate, Polycarboxylate Superplasticizer, Sodium Polynaphthalnene Sulfonate, Dispersant MF, etc. In the meantime, "customized production" consept is initially posted and implemented, which is to satisfy customer's needs more well from different industries. The company also have regular training to internal staffs, provide practical solutions according to customer's concerns about products usages, after-sales services, etc, through which is recognized by customers from home and abroad. We sincerely expect pleasant cooperation with you hand in hand for mutual growth!